برازش, محمد. (1396). کاربرد معادله اویلر دامنه سیگنال تحلیلی‌های جهتی در تعیین مکان و نوع چشمه‌های آنومالی گرانی. مجله ژئوفیزیک ایران, 11(3), 33-44. محمد برازش. "کاربرد معادله اویلر دامنه سیگنال تحلیلی‌های جهتی در تعیین مکان و نوع چشمه‌های آنومالی گرانی". 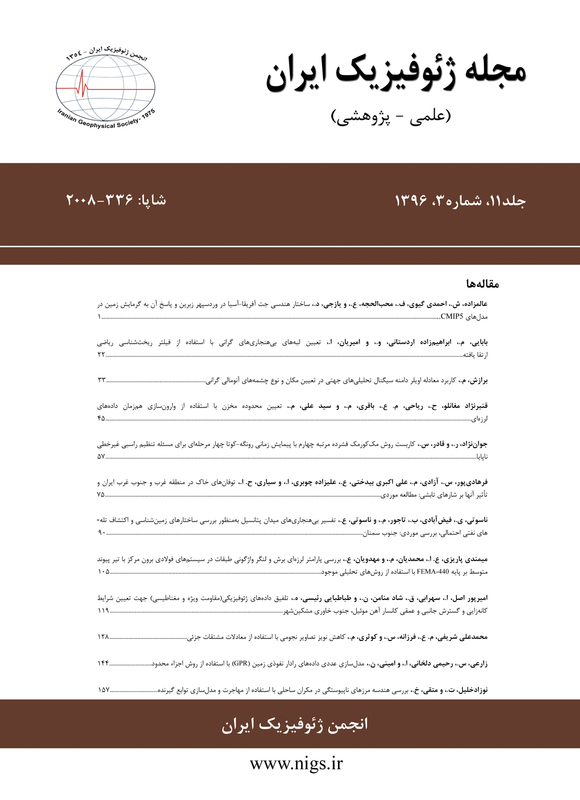 مجله ژئوفیزیک ایران, 11, 3, 1396, 33-44. برازش, محمد. (1396). 'کاربرد معادله اویلر دامنه سیگنال تحلیلی‌های جهتی در تعیین مکان و نوع چشمه‌های آنومالی گرانی', مجله ژئوفیزیک ایران, 11(3), pp. 33-44. برازش, محمد. کاربرد معادله اویلر دامنه سیگنال تحلیلی‌های جهتی در تعیین مکان و نوع چشمه‌های آنومالی گرانی. مجله ژئوفیزیک ایران, 1396; 11(3): 33-44. روش استاندارد اویلر روشی خودکار در تفسیر داده‌های میدان پتانسیل است که در سال‌های اخیر استفاده از آن گسترش زیادی پیدا کرده است. نتایج این روش وابسته به ‌دقت پارامتر اندیس ساختاری فرض شده دارد و در حضور چشمه‌های تداخلی دقت نتایج کاهش می‌یابد. به‌منظور از بین بردن این مشکل روش‌های متعددی بر اساس مشتقات این معادله طراحی ‌شده‌اند که یکی از آنها دامنه سیگنال تحلیلی‌های جهتی است. دامنه سیگنال تحلیلی‌های جهتی توابعی همگن هستند و در معادله اویلر صدق می‌کنند که بدین‌وسیله می‌توان علاوه بر تخمین موقعیت چشمه به‌صورت هم‌زمان اندیس ساختاری را نیز تخمین زد. سیگنال تحلیلی‌های جهتی از مؤلفه‌های تانسور گرادیان گرانی به دست می‌آیند و در این مقاله در حالت کلی اثبات ‌شده است که هرکدام از توابع دامنه سیگنال تحلیلی‌های جهتی در جهات x، y و z در معادله اویلر صدق می‌کنند. از ترکیبات آنها دو معادله جدید نتیجه شد که در تعیین موقعیت و اندیس ساختاری چشمه بسیار مؤثر است. کاربرد هرکدام از سیگنال تحلیلی‌های جهتی به‌صورت جداگانه و توأمان در تعیین موقعیت و اندیس ساختاری به مدلی در حضور چشمه‌های تداخلی و نوفه گاوسی نسبتاً بالا اعمال شد. دامنه سیگنال تحلیلی در جهت z و استفاده هم‌زمان از هر سه دامنه سیگنال تحلیلی‌های جهتی مشابه با دو معادله جدید معرفی ‌شده در این مقاله نسبت به سایر معادلات نتایج بهتری ارائه دادند. سرانجام این روش‌ها بر روی‌داده‌های واقعی گرانی کانسار منگنزی صفو واقع در 25 کیلومتری شهرستان چالدران بکار رفت و برای این معدن مقداری برای عمق (حدوداً 6 متر) و اندیس ساختاری با مقداری منفی و نزدیک به صفر تخمین زده شد. The components of Gravity Gradient Tensor (GGT) is used for second-order derivatives of the gravitational potential field in the directions x, y and z in a Cartesian coordinate system. The third column of the gravity gradient tensor is Hilbert transform pairs of the first and the second columns. Many methods have been designed to estimate the depth, the horizontal position and the type of the sources from gravity gradient tensor components. Often, these methods are used derivatives of potential field data or their compounds in directions x, y, and z. Standard Euler deconvolution method is an approach in the interpretation of potential field data. It is able to locate the sources and to estimate the regional parameters with the assumption of the structural index. This approach is an automated method that has seen rapid development in recent years. The result of this method closely related to the precision of the assumed structural index parameter, and the accuracy is reduced in the presence of interference sources. Euler deconvolution of the directional analytic signal amplitudes is one of many methods to eliminate this problem. It is shown that the components of the gravity vector satisfy Euler's equation. Thus, it is proved that the amplitudes of directional analytic signal are homogenous and by putting in Euler's equation can estimate the location and the structural index of the gravity anomalies. In addition, two new equations were obtained from the combination of directional analytic signal amplitudes that is very effective in locating and estimating the structural index of gravity sources. This paper was examined the application of Euler's equation of the directional analytic signal amplitudes to determine the location and the structural index of gravity anomaly sources. First, it is proved that each of directional analytic signal amplitudes in directions x, y, and z satisfy Euler's equation. Second, using the combination of directional analytic signal amplitudes derived two new equations that is more successful in determining the location (horizontal positions and depth) and source type (structural index) directly over the edges of gravity anomaly sources. The maxima of analytic signal amplitude in the z- direction place directly on the edge of the anomaly sources, but the maxima of analytic signal amplitude in the x- and y- directions deviate from the edges. That is why the simultaneous use of two or three-directional analytic signal amplitude can provide more accurate solutions. The method described above was tested on the synthetic model in the presence of relatively high level Gaussian noise and interference sources. Finally, the method was applied to the Safoo manganese ore and obtained horizontal position, depth (~6 m) and structural index. MATLAB software was used to apply the above-mentioned methods. Beiki, M., 2010, Analytic signals of gravity gradient tensor and their application to estimate source location: Geophysics, 75(6), I59-I74. Beiki, M., and Pedersen, L. B., 2010, Eigenvector analysis of gravity gradient tensor to locate geologic bodies: Geophysics, 75(6), I37-I49. Blakely, R. J., and Simpson, R. W., 1986, Approximating edges of source bodies from magnetic or gravity anomalies: Geophysics, 51(7), 1494-1498. Debeglia, N., and Corpel, J., 1997, Automatic 3-D interpretation of potential field data using analytic signal derivatives: Geophysics, 62(1), 87-96. Ma, G., 2014, The application of extended Euler deconvolution method in the interpretation of potential field data: Journal of Applied Geophysics, 107, 188-194. Ma, G., Huang, D., and Liu, C., 2013, Application of balanced edge detection filters to estimate the location parameters of the causative sources using potential field data: Journal of Applied Geophysics, 99, 18-23. Mikhailov, V., Pajot, G., Diament, M., and Price, A., 2007, Tensor deconvolution: A method to locate equivalent sources from full tensor gravity data: Geophysics, 72(5), I61-I69. Nabighian, M. N., and Hansen, R., 2001, Unification of Euler and Werner deconvolution in three dimensions via the generalized Hilbert transform: Geophysics, 66(6), 1805-1810. Reid, A. B., Allsop, J., Granser, H., Millett, A. T., and Somerton, I., 1990, Magnetic interpretation in three dimensions using Euler deconvolution: Geophysics, 55(1), 80-91. Reid, A. B., Ebbing, J., and Webb, S. J., 2012, Comment on ‘A crustal thickness map of Africa derived from a global gravity field model using Euler deconvolution’ by Getachew E. Tedla, M. van der Meijde, A. A. Nyblade and F. D. van der Meer: Geophysical Journal International, 189(3), 1217-1222. Reid, A. B., Ebbing, J., and Webb, S. J., 2014, Avoidable Euler Errors–the use and abuse of Euler deconvolution applied to potential fields: Geophysical Prospecting, 62(5), 1162-1168. Roest, W. R., Verhoef, J. and Pilkington, M., 1992, Magnetic interpretation using the 3D analytic signal: Geophysics, 57(1), 116-125. Thompson, D., 1982, EULDPH: A new technique for making computer-assisted depth estimates from magnetic data: Geophysics, 47(1), 31-37. Zhang, C., Mushayandebvu, M. F., Reid, A. B., Fairhead, J. D., and Odegard, M. E., 2000, Euler deconvolution of gravity tensor gradient data: Geophysics, 65(2), 512-520.